The 'grand challenges' of healthcare are changing rapidly. Modern health crises such as childhood obesity, widening health disparities, and accelerating medical costs will not be solved with traditional approaches alone. These challenges call out for a new kind of doctor – creative physician-leaders with clinical mastery and the ability to develop and contribute to systems-based, patient-centered solutions to complex health problems. At UVA's Medical Design Program, we teach design thinking to our medical students as a framework for developing and leading new approaches to patient care throughout their careers. UVA is among a growing group of medical schools and health systems exploring ways in which design thinking can be integrated into medical education and help future physicians apply this proven problem solving approach in service of improving patient care and public health. The UVA Medical Design Program offers first-year medical students a chance learn and apply design thinking skills and approaches to improve patient care. Through a series of monthly hands-on 'sprint-style' design workshops and structured research experiences, our students learn design-based approaches to clinically-relevant skills like patient interviewing, synthesis of quantitative and qualitative research data, and use of prototypes to rapidly test and refine ideas in context of team-based healthcare environments. Our students work directly with faculty physicians, patients, nursing, and other healthcare team members . Graduates of the medical design program have applied these new skills in a broad variety of settings from clinical research to international advocacy. 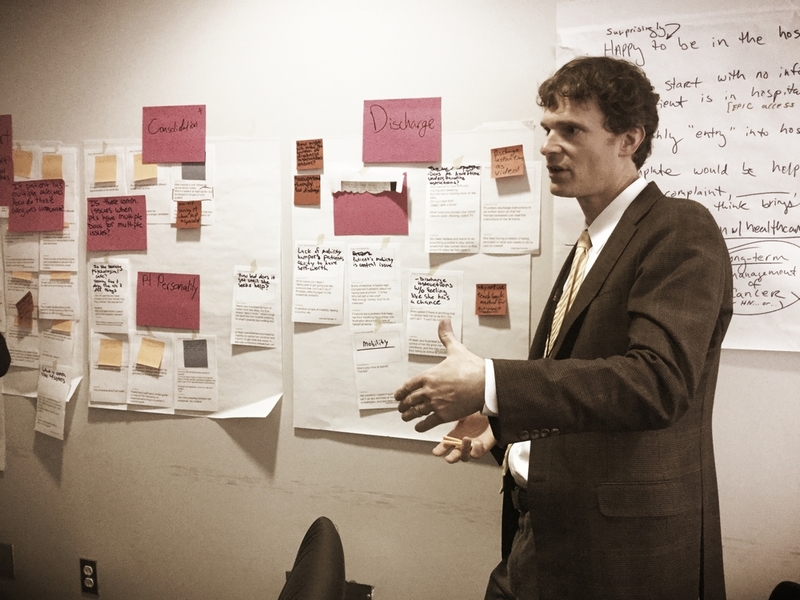 In the Medical Design Program's first year, our students partnered with members of UVA's Be Safe quality improvement initiative to learn design thinking by applying it to two important issues in the health system. At first glance, a hospital’s 30-day readmission rate is a simple metric: how many patients are readmitted to the hospital in the month following a prior admission? But when a patient is in this situation, it is often the result of a complex interplay of pathophysiologic, socioeconomic, cultural, and other factors. Our students delved deeply into the patient perspective, working with patients and health system leaders to identify how we might empower patients to stay well and avoid repeated hospital admissions. The team realized that confusing discharge instructions caused patients to have a hard time following their treatment and follow-up regimens after going home, leading to readmissions. Students proposed improvements to the “After Visit Summary” that each patient receives at the end of a hospital stay so that each patient would have a clear understanding of what to expect after discharge and how to maintain their health at home. Falling in the hospital can be extremely debilitating for patients. Preventing patient falls has become a quality-improvement priority at hospitals throughout the United States. But despite these efforts, falls remain difficult to prevent across the health system. Our students worked on potential solutions to this issue using a variety of design research methods, including role-playing sessions that simulated navigating a hospital with various disabilities, to understand the challenges that patients face and the factors that cause patient falls. The team’s research led them to reconsider two important factors: (1) bathrooms are the site of most falls. The design of bathroom thresholds and spaces is highly variable, so the team proposed standardization to accommodate patients with limited mobility. (2) Trying to walk with poor balance and vision, some patients lean heavily on rolling IV poles, turning them into dangerous "canes-on-wheels.” This insight led the team to explore how they might redesign common hospital equipment and develop new walking aids to reduce the frequency and severity of inpatient falls. The Emergency Department waiting room is often an unfamiliar, uncomfortable, and even frightening place for patients. At the same time, it is also many patients’ first encounter with the health system. Our students tackled the issue of how we might improve the waiting room experience, and ultimately, patients’ overall experience at the hospital. After interviewing patients and families in the ED waiting room and other waiting areas around the hospital, students synthesized their findings into several patient- and family-centered solutions. One example: the "Comfort Cabinet,” a collection of supportive items - like water and warm blankets - that front desk staff can provide for patients to make them as comfortable as possible as they enter the ED. With a major renovation of the UVA Emergency Department (ED) underway, students did extensive research in the ED to surface insights about how UVA might improve and transform important aspects of the ED experience for patients, their families and caretakers, and clinicians. At the end of the spring semester, they presented the results of their research and made recommendations to ED leadership. After it is determined that a patient should be admitted to the hospital, a patient can spend hours in the ED waiting to be admitted. This contributes to the limited number of beds available for seeing new patients, thus increasing wait times for new patients entering the ED. Furthermore, being admitted to the hospital is a long, multi-step process that involves multiple departments. Frequently, patients and families are frustrated by how long the admission process takes. Our students examined how best to communicate this complicated (and often uncertain) process to patients and their families. As a result, they imagined a digital dashboard that would pool information from the patient's electronic medical records and the hospital's bed management system to provide real-time updates to patients, keeping them informed about the admission process and alleviating much of the anxiety of waiting. Patients and their loved ones want to feel valued and cared for as soon as they enter the hospital, but the crowded and unpredictable nature of the ED often leads to long, uncomfortable waits, especially for patients with low-acuity issues. Students re-imagined the waiting room and explored ideas from outside the healthcare sector for how UVA might provide a comfortable, reassuring, and even enjoyable waiting room experience. For example, students looked at ways to allow patients to move freely about the hospital, such as by using a restaurant-style buzzer system for queueing and notifying patients when a space is ready for them in the ED. Students explored ways to make waiting enjoyable and entertaining, such as "in-flight movies" and amusing features of lines for theme park rides. They also developed ideas for more spaces where patients could wait, such as a café near the waiting room, a children's play area, and grouped seating for families, and how to apply principles of biophilic design to make sure that the waiting room helps keep patients calm and relaxed while waiting for care. In crowded EDs, patients don’t always get a room to themselves. Some end up being treated in beds lining the halls due to space constraints. Some patients like the hallway (“It’s like a front row seat!”) but others find it uncomfortable and unpleasant. Our students examined how to improve the hallway bed experience for patients in light of patients' differing treatment needs, desire for privacy, preferences and expectations about the ED experience. Students explored ways that comfort and privacy might still be provided in this care setting via modular walls, shielding space dividers, and re-imagined fast-track areas that boost ED throughput and reduce or eliminate the need for hallway beds. Patients want to know what’s going on when they're in the Emergency Department, keeping up with information about wait times, medications, procedures, admissions, discharges, and more, but this information is not always clearly provided to patients and their caretakers. Furthermore, patients enter the ED with a number of questions and worries already on their minds from the moment they enter the door. In order to inform patients about their ongoing ED experience, students considered implementation of tablet-based resources to improve patient education and increase patient satisfaction with their ED visits. In the Medical Design Program's third year, our students developed their design skills through workshops conducted with a range of partners in and outside UVA. These included internists and surgeons from the health system, entrepreneurs, investors, and strategy experts from UVA's Darden School of Business and Licensing & Ventures Group, and design professionals from mobile application development company WillowTree and architecture firm VMDO. For more information about how the Medical Design Program teamed up with VMDO, see this article.